The majority of Sage Accpac users are running their accounting software on a PC. We do support a few clients running Accpac on a Mac. Today we are hosting a Sage Accpac Tips & Tricks web training seminar which includes a section on keyboard shortcuts. The keyboard shortcuts portion is focused on PC users so we are posting this list of shortcuts for our Apple Mac Accpac users. 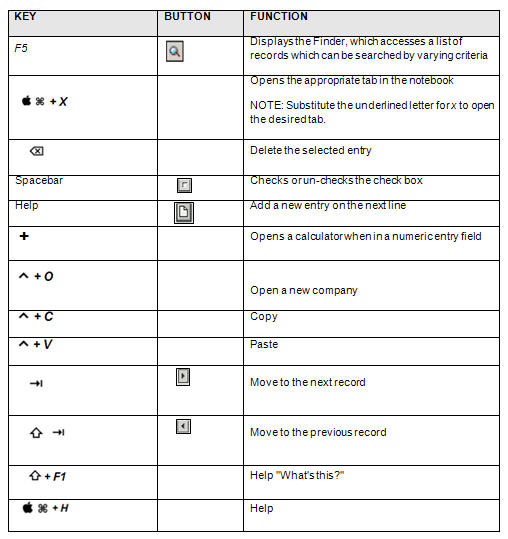 Below is a chart showing some of the Mac Accpac Shortcut keys. If you are a Mac user and would like to share additional Mac Accpac keyboard shortcuts, please feel free to email us and we will share them with other users. If you are interested in seeing our list of upcoming web training seminars, please click here. The training webinars are held monthly and topics differ each month. Visit our Accpac Training and Events page for more useful tips, tricks, and training opportunities.